Offset printing is evolutionarily the finest printing method falling under planography. 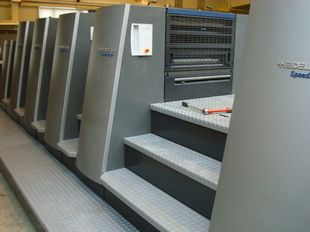 Offset printing can be divided in the conventional (wet) offset printing and the dry offset printing. The difference is in the presence or absence of the water in the print. Offset printing was invented at the beginning of 20th century in response to increased requirements for the printing speed. So far used lithographic method could not make enough copies and required to be improved. The first references to the offset printing showed up already at the end of the 19th and at the beginning of 20th century the first offset machines appeared. The first offset printing machine was built in Germany, Europe, by Kašpar Hermann, a German-US citizen. He also patented the principles of a rotary offset machine. Since then the offset principle has not undergone significant modifications and offset printing is nowadays the most common printing method. Offset is a type of indirect planography. The pattern is not transferred directly from the printing forme wrapping the plate cylinder but via an interlink. The interlink is a rubber-coated steel transfer roller. Offset printing machines are now manufactured exclusively in the rotation version and they are based on the roller and cylinder assembly. The plate cylinder bearing the printing forme, transfer roller, ink rollers, water roller and impression roller. The pattern transfer principle itself is then simple. The plate cylinder is surrounded by the ink rollers and a water roller. As the plate cylinder rotates, first it is moisturized and then the ink is applied on it. However, in the next step the pattern is not printed directly on the substrate, as it was with its predecessor - lithography, but the transfer roller is used instead. The pattern is therefore printed on its rubber surface and only then the transfer roller transfers the pattern to the substrate. With the dry offset the principle is the same but the moisturizing part is left out, thus the wet roller is not used. On the contrary, the roller thermoregulation principle is utilized here. If the temperature is too high the ink viscosity is higher and the ink can easily adhere also to the non-printing areas and the print "smudges". If the temperature is too low the ink does not easily adhere even on the printing areas. Printing surfaces are water-repellent and non-printing surfaces are water-receptive. The oil ink used is a water-repellent fluid and thus it does not adhere on the non-printing areas of the printing plate. 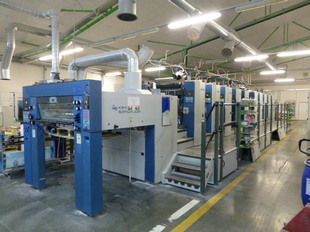 Dry offset printing works without water. Physico-chemical difference on the printing plate (forme) thus lies in something else. The complete printing plate is coated with two layers with different properties. The bottom layer is made of polymer and the top layer is made of silicon. The polymer layer creates the printing areas and the ink adheres to it. The top silicon layer creates the non-printing areas and the ink does not adhere to it. The master copy that needs to be multiplied is burnt into the printing plate with a laser beam that removes only the top silicon layer. It reveals the bottom polymer layer and creates printing areas. The dry offset disadvantage is so called flaking of the ink. During the printing process the dust particles are created from flaking at the border of printing and non-printing areas. It results in small white spots on the printed pattern. This issue is apparent after several hundreds of printed copies, thus the dry offset method is more suitable for low cost jobs. The issue can be corrected so that the rollers are washed at regular intervals. When using the wet offset, small problems are caused by the water used. It is more difficult to maintain the ink balance and a small amount of water may cause outstretching of the paper. It is the most common method for printing of newspapers, books, magazines, brochures, leaflets, and maps. So the most often used substrate is paper. The offset printing does not serve a wide choice of substrates but due to a high print quality, printing speed and relatively low costs for the pre-printing preparation work, the market share of this method is approx. 60%.